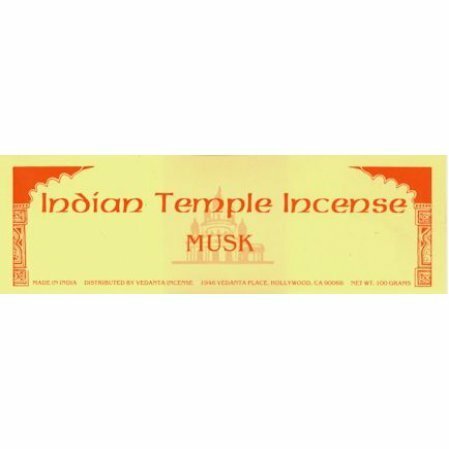 This fragrance is part of our Indian Temple Incense series. Musk has always been intimate and moving for me. It has given me courage I otherwise would never have had. It got me in touch with my passion and gave me peace. vedanta musk incense is unsurpassed. Usually buy the 100 gram pack, but since it was out of stock, vedanta sent the equivalent in smaller packs which I appreciated. Deliveries are always prompt and it is the best place to buy incense with many fine varieties to choose from. I've also tried rose, sandalwood and other scents and love them all. The Musk is a must! The best musk incense I have ever come upon. I have been using this since one 1980's and no other compares in quality or value. I like to burn 1 musk: 2 sandlewood. The combination is heavenly and lasting. I highly recommend it. I started buying incense from Vedanta back in the 60's when I lived in Los Angeles. I loved the center at Vedanta Place. Anyway, my current favorite fragrance is Musk, but there are so many incredible ones. My favorite used to be Neroli but something has changed and it doesn't smell like it used to. Maybe it's because my smeller is getting old!! Anyway, thank you for making these beautiful products available. While I don't mind other types of incense Vedanta Musk has been, and continues to be, my favorite. Over the more than 40 years I've been using it the formulation has more than likely gone through changes. In my opinion the smell and character has remained remarkably consistent . I continue to be a happy incense burner! Thank you! Over the past (many, could it have been 40?) years I have ordered my incense from the Vedanta Temple outlet, first when I moved away to Santa Maria Ca. an d thereafter from Kentucky. The quality of ALL the various kinds of Indian incense was excellent, the scents fragrant and never obtrusive - the sticks securely packaged. Invariably for a period of happy memories I imagined myself back in the atmosfere of the exquisite Santa Barbara Temple building, listening to the voice of Swami Prabhavananda. Very strong, so I typically use only 1/2 stick at a time. If you like the Musk scent, however, I think you'll enjoy this. I'VE BEEN ORDERING THIS FOR YEARS AND IT CONTINUES TO BE MY FAVORITE.